This carving is a dried maté gourd, crafted by a native Indian artesano in Peru. Gourds are available in a variety of sizes, so artisans usually contract with growers for a certain approximate size in the sowing season, October. After harvesting, the gourds are sun-dried for about six months so they are ready to be worked the following June. A pipe, made from hollow eucalyptus branches, is put in a fire. The artesano then blows air through the hot pipe to scorch the gourd, creating beautiful patinas on the outer surface. Later, the gourd is intricately carved using typical woodworking tools. This gourd has been wood-burnt and carved to look like a fat flute player. 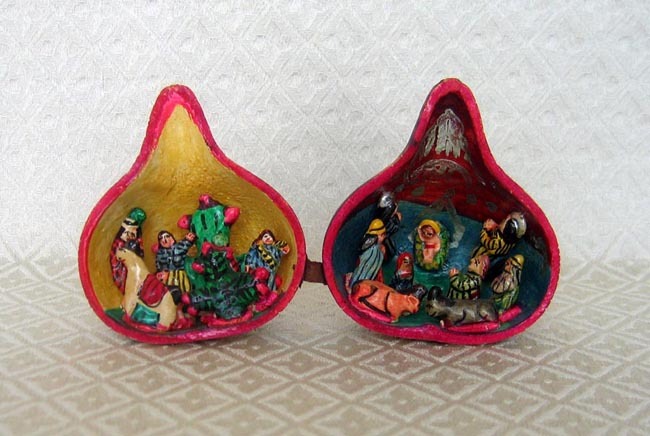 It opens to reveal twin retablos, or dioramas. The right side depicts a Nativity scene (complete with baby Jesus, Mary, Joseph, the wise men and 2 barn animals) and the left side shows a Peruvian family with their llama and prickly pear cacti with crimson fruit called tuna. It stands about 4 inches tall and is just over 3 inches at the base. The tiny figurines are from 1 to 1.5 inches either tall or wide.